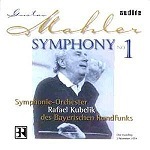 Mahler's first four symphonies are often classed as his "Wunderhorn" group owing to thematic and emotional links with settings of songs from the anthology of German folk poems "Des Knaben Wunderhorn" ("Youth's Magic Horn"). Strictly speaking, the First Symphony doesn't fulfil this criterion for inclusion as a "Wunderhorn" symphony as its thematic and emotional links are with Mahler's first song cycle, "Lieder Eines Fahrenden Gesellen" ("Songs of a Wayfarer"), of which both words and music were written by him under the influence of first love and rejection. But it's a useful classification because the Wayfarer songs and the First Symphony do inhabit the same thought and sound world of symphonies 2,3, and 4. 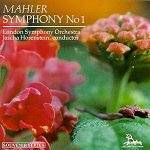 The First sets out a richly representative store of Mahler's characteristic styles especially as seen through the prism of this first period in his creative life and tells us a great deal about the man at that time. It also turns a key that admits us through the door to what is to come making the First the ideal work with which to begin exploration of Mahler's life and work. At the start there is a seven octave A in the strings depicting the mood of early morning in high Summer; in the second movement a clumsy peasant dance establishes a love of dance which will later grow to an obsession; in the third a weird canon on the tune "Frere Jacques" interspersed with cafe band music in Mahler's sleaziest vein illustrates his habit of juxtaposing the gross with the sublime; in the last movement there is music intent on outdoing itself in world-storming excess - noisy triumph exploding with youthful bravado out of self-absorbed emotional reflection. There are two significant quotations from Wayfarer songs as well to remind us that all of his symphonies will "touch base" in the lied at some point. An acid test for Mahler idiom is how the third movement is played. Most recordings and performances these days seem bent on prettifying it, most especially the opening double bass solo. You have to go back to conductors like Mitropoulos (Sony 62342 purchase) and Adler (Tahra TAH239240 purchase) to hear it played how I think Mahler intended it and these two recordings are essential for the Mahler completist and enthusiast, though some limited mono sonics have to be allowed for. In his keynote lecture to the 14th Colorado Mahlerfest Donald Mitchell referred to how he had tried and failed to stop the principal double bass of one of the world�s great Mahler orchestras "beautifying that opening solo and thus stripping it of its intended character and above all of its power to shock." I agree with Mitchell about this passage needing to deliver as much of its original "power to shock" and I long to hear modern performances where this is realised. There is an earlier version of this work with slightly different orchestration and an extra movement - a short, lyrical piece called "Blumine" - that Mahler discarded when he submitted the whole work to revision. The earlier version also had a title, approximately "Titan, tone poem in symphonic form". The title was also discarded with the extra movement so there is no real justification in record companies or concert promoters using the title "Titan" now when playing the revised version which is the one herd in concert halls and on record. To do so is to swim against Mahler's wishes, as also is the occasional practice of "restoring" the discarded "Blumine" movement in its old place in the final version of the symphony. To do all this creates a bit of a hybrid. You can hear the discarded movement still as it is sometimes included on recordings as a fill-up. Listen to it by all means but as a "standalone" piece of early Mahler. There is, however, a recording of that early version of the symphony where the inclusion of "Blumine" makes textural sense. It is conducted by Ole Kristian Ruud with the Norrkoping Symphony orchestra. (Simax PSC 1150 purchase). The precise history of the score need not detain us since it�s a complex and by no means completely solved puzzle, but suffice it to say that what we have on this release presents broadly the penultimate stage in the work�s development heard in Hamburg in 1893 where it carried the title "Titan, Symphonic poem in the form of a symphony. There are even more questions raised by this recording, though. Not least the accuracy of the published orchestral parts that would have been used and their relationship to the manuscript at Yale University to which provenance is claimed. The latter is itself by no means a clean set of documents either, a fact the notes fail to mention. But discussion of all these fine points are beyond the scope of this survey. Having made these caveats clear I think we can rely on this recording taking us close to what Mahler presented in Hamburg in 1893, though it cannot be said with confidence to be exactly what he conducted. The differences between the First Symphony we are familiar with and this 1893 Hamburg version may not seem all that great on first hearing, but they are significant. The performance itself is not one filled with special insights, however. Were it not for the fact that this is the only recording available of the 1893 version it would not deserve to make much of a splash at all. No composer quite exposes the second rate in orchestral playing like Mahler and the Norwegian orchestra never rises above that level as they give us a workmanlike, but ultimately uninspired, performance with strings rather undernourished, brass on the thin side and woodwind failing to really make any impression above playing the notes in the right order. This is a release that ought to be on the shelf of anyone interested in this composer�s work. 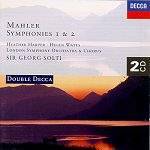 While we continue to await a recording of the score by one of the great orchestra/conductor partnerships it will serve us well enough and we can now move on to recordings of Mahler�s revised score, the one always performed and recorded where we are spoilt for choice. For many Mahlerites over a certain age Rafael Kubelik has always been there like a dependable uncle, part of the Mahler family landscape. He made one of the earliest studio recordings of this work with the Vienna Philharmonic for Decca in the mid-1950s and that recording had a real sense of discovery about it. He was also one of the first to record a complete cycle after many years of performing the music in the concert hall, and that DG cycle made in Munich has hardly been out of the catalogue since the 1970s. Yet it has never quite made the "splash" that those by some of his colleagues have. Kubelik�s view of Mahler is not one that attaches itself to the mind at a first, or even a second, listening. He was never the man for quick fixes or cheap thrills in any music he conducted. Not for him the heart-on-sleeve of a Bernstein, the machine-like precision of a Solti, or the dark 19th century psychology of a Tennstedt. Kubelik�s Mahler goes back to folk roots, pursues more refined textures, accentuates song, winkles out a lyrical aspect and so has the reputation of playing down the angst, the passion, the grandeur. But note that I was careful to use the word "reputation". I often wonder whether those who tend to pass over Kubelik�s Mahler have actually listened hard over a period of time to his recordings. I think if they had they would, in the end, come to agree that whilst Kubelik is certainly excellent at those qualities for which his Mahler is always recognised he is also just as capable of delivering the full "Mahler Monty" as everyone else is. It�s just that he anchors it harder in those very aspects he is praised for, giving the rest a unique canvas on which he can let whole of the music breathe and expand. It�s all a question of perspective. Kubelik�s Mahler takes time, always remember that. Many others who tend not to rate Kubelik highly in certain later Mahler Symphonies if they were of a mind to rate his First Symphony might feel constrained to point out that the First is, after all, a "Wunderhorn" symphony and that it is in the "Wunderhorn" mood where Kubelik was at his strongest. I don�t disagree with that as an explanation but, as I have said, I think that in Mahler Kubelik was so much more than a two or three trick pony. In fact in the First Symphony Kubelik�s ability to bring out the grotesques, the heaven storming and the romance was just as strong as Bernstein or Solti. It�s a case of perspectives again. In his studio cycle for DG the First Symphony was always one of the most enduring. It has appeared over and over again among the top recommendations of many critics, including this one, but I believe it has now been superseded by another version conducted by him with the same orchestra but this time playing "live" and released on Audite. The studio version had one particular drawback noted by even its most fervent admirers. A drawback it shared with most of the other recordings in the cycle. It lay in the recorded sound given to the Bavarian Radio Orchestra by the DG engineers. Balances were close, almost brittle. The brass, trumpets especially, were shrill and raucous. There was an overall "boxy" feeling to the sound picture. I have never been one to dismiss a recording on the basis of recorded sound alone unless literally un-listenable. However, even I regretted the sound that this superb performance had been given. This is not the only reason I am now going to recommend this 1979 "live" recording on Audite (95.467) over the older DG, but it is an important one. At last we can now hear Kubelik�s magnificent interpretation of this symphony, and the response of his excellent orchestra, in beautifully balanced and realistic sound about which I can have no criticism and nothing but praise. Twelve years after the studio recording Kubelik seems to have taken his interpretation of the work a stage further too. Whether it�s a case of "live" performance before an audience leading him to take a few more risks, play a little more to the gallery, or whether it�s simply the fact that he has thought more and more about the work in subsequent performances, I don�t know. What I do know is that every aspect of his interpretation I admired first time around in the DG version is presented with a degree more certainty, as though the 1967 version was "work in progress" and this is the final statement. Straight away the opening benefits from the spacious recording with the mellow horns and distant trumpets really giving that sense of otherworldliness that Mahler was surely aiming for. Notice also the woodwinds� better balancing in the exposition main theme which Kubelik unfolds with a telling degree more lyricism. One interesting point to emerge is that after twelve years Kubelik has decided to dispense with the exposition repeat and it doesn�t appear to be needed. In the development the string slides are done to perfection, as good as Horenstein�s in his old Vox recording. Kubelik also manages an admirable sense of mounting malevolence when the bass drum starts to tap softly. Nature is frightening, Mahler is telling us, and Kubelik agrees. The recapitulation builds inexorably and the coda arrives with great sweep and power. At the end the feeling is that Kubelik has imagined the whole movement in one breath. The second movement has a well-nigh perfect balance of forward momentum and weight. There is trenchancy here, but there is also a dance element that is so essential to make the music work. Some conductors seem to regard the Trio as a perfunctory interlude. Not Kubelik. He lavishes the same care on this that he lavishes on everything else and the pressing forward he was careful to observe in the main scherzo means he doesn�t need to relax too much in order to give the right sense of respite. There is also an air of the ironic, a feeling we are being given the other side of one coin. The third movement remains one of the most extraordinary pieces of music Mahler ever wrote. The fact that it was amongst his earliest compositions makes it even more astounding. I have always believed that in this movement Mahler announces himself a truly unique voice for the first time and Kubelik certainly seems to think this in the way he rises to the occasion. He has always appreciated the wonderful colours and sounds that must have so shocked the first audience but in this recording we are a stage further on in the interpretation than in his previous version. Right at the start he has a double bass soloist prepared to sound truly sinister and one who you can really hear properly also. As the funeral march develops, a real sense of middle European horror is laid out before us. All the more sinister for being understated by Mahler but delivered perfectly by a conductor who is prepared to ask his players to sound cheap, to colour the darker tones. This aspect is especially evident in the band interruptions where the bass drum and cymbals have a slightly off-colour, Teutonic edge which, when they return after the limpid central section, are even more insinuating and menacing. Kubelik seems to have such confidence in the music that he is able to bring off an effect like this where some others don�t. In the chaos unleashed at the start of the last movement you can hear everything in proper perspective, brass especially. The ensuing big tune is delivered with all the experience Kubelik has accumulated by this time, but even I caught my breath at how he holds back a little at the restatement. Even though the lovely passage of nostalgic recall just prior to the towering coda expresses a depth and profundity only hinted at in 1967 it is the coda itself which will stay in your mind. As with the DG studio recording Kubelik is anxious for you to still hear what the strings are doing whilst the main power is carried by brass and percussion. Kubelik is also too experienced a Mahlerian to rush the ending. Too many conductors press down on the accelerator here as if this will make the music more exciting, and how wrong they are to try. Listen to how Kubelik holds on to the tempo just enough to allow every note to tell. He knows this is so much more than just a virtuoso display, that it is a statement of Mahler�s own arrival, and his care and regard for this work from start to finish stays with him to the final note. So Kubelik on Audite is a top recommendation for this symphony and, I think, even surpasses in achievement those by Horenstein and Barbirolli to name two other favourite versions from a previous generation I regard as essential to any collection and which I will come to below. Like Kubelik, Jascha Horenstein first made a recording of this work in Vienna in the mid-1950s and this is still available on Vox coupled with a Bruckner Ninth of the same vintage (CDX2 5508 purchase) and on Preiser (90669 purchase). Horenstein didn't have the benefit of the Vienna Philharmonic and though the Vienna Symphony play well and idiomatically it's their contribution which lets him down, especially in the last movement where Horenstein's demands stretch them too far. The recording is also boxy and close-miked. Fortunately, Horenstein recorded the work again, this time with the London Symphony Orchestra in 1970 for Unicorn-Kanchana (UKCD2012) and this version supersedes his earlier one in almost every respect. The introduction is as clear and expectant, as with Kubelik, but there is a greater sense of space both in the pacing of the music, the playing of the orchestra and the more atmospheric recording. Horenstein shares also Kubelik's simplicity in the main theme but I like the way he builds in more mystery to the arrival of the soft horn announcement of, what will become, the clinching motive at the climax of the exposition. This is real concert hall "theatre" worthy of a Furtwangler. At the rip-roaring climax note too Horenstein's acute ear for the particular sound of the Mahler orchestra, for contrasts and for the special instrumentation. A slight slowing for dramatic effect is a surprise but such is Horenstein's long-term planning it doesn't obtrude. The Scherzo has more bucolic a swing to the dance and a nice trenchancy which contrasts beautifully with some perky clarinet contributions in the Trio. In the third movement funeral march Horenstein keeps up a slightly faster tempo than usual but, as so often with this conductor, his tempo choice is unerringly the right one for what he wants to say. He recognises, as does Kubelik, that this is a parody and should have the mood of fantasy too. His band interjections really seem to touch a nerve and in the quotation from the Gesellen song that forms the emotional core note the bassoon contribution, the kind of detail highlighting Horenstein was renowned for as it undermines the texture like a worm in the flower bed - very Mahlerian ! When the march returns Horenstein doesn't force the "oom-pah" rhythms of the band but they make their effect which, it is surprising to report, is not as usual as you might think. The benefits of the virtuoso LSO of that period are apparent in the opening onslaught of the fourth movement: "The cry of a deeply wounded heart". Nothing seems beyond this orchestra and their contribution lifts the passage to an almost cosmic level, accentuating the bravado of the young Mahler. Horenstein refuses to wear his heart on his sleeve in the lovely transition into the lyrical second subject, so the great theme emerges from out of exhaustion as a consolation, heart-easing rather than heart-wrenching. In the central section where the battle is resumed and the end signalled Horenstein, ever master of structure, holds something back for the coda and then with what potent nostalgia he paints the final look-back to the start of the symphony: horns calling from immense distances and also note the picking out of a violin harmonic. The end does not disappoint. In fact Horenstein even has a surprise in store. At the point in the score marked "Pesante-triumphal", where the horns should be standing up, Horenstein slows the tempo down in the kind of rhetorical gesture he was not usually known for. The effect is to lift the music again to another level and make no apologies for what always teeters on the edge of banality. In so doing he wins us over with his sheer audacity. This is a very special recording of the First Symphony that ought to be in every collection. 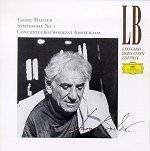 There are a number of recordings of this symphony conducted by Bruno Walter available, but only two are studio recordings as opposed to some live "airchecks". The first was made in 1954 in New York and in its latest remastering on Sony is certainly one for the serious Mahlerite's shelf. The playing of the New York Philharmonic, one of the great Mahler orchestras with a proud tradition stretching back to the composer himself, is superb and one of the jewels of this recording, along with the interpretation of a man who was the composer's friend and protégé. But if I choose instead the 1961 stereo remake with the Columbia Symphony in Los Angeles on Sony (SM2K 64447 purchase- a two disc set with Walter's classic recording of Mahler's Second) it's because I feel he penetrates even deeper into this work, even though the orchestra is not quite the match in weight of tone or commitment compared with the New Yorkers. Another gain in the remake is the richer recording in stereo. Walter's introduction to the first movement is a degree more literal than Kubelik's or Horenstein's, but it's marginal and the stillness is sustained just as well. Though note how this is broken by the pizzicato interjections, startling us across each string section. The way Walter unfolds the Wayfarer theme is just as unforced and eloquent as his two colleagues but he favours a little more brooding portent in the lead-up to the soft horn announcement of the clinching motive and the recording allows us to hear a splendid soft bass drum with it also. There is plenty of raw energy and power in the great outburst at the climax of the development and the closing pages are perhaps more exhilarating under the octogenarian Walter than with men a third his age. In the Scherzo the feeling of being in the hands of someone in whom this music is bred in the bone starts to become even more apparent first in the way the lower strings dig trenchantly into the dance then in the way the woodwinds cluck at the inner voices and finally in the waltz element of the Trio. There is such a wealth of experience that you miss when you hear many later recordings that I wonder whether a sustained period of listening to a Walter recording really ought to be compulsory for all the young whippersnappers who think all they have to do with this music is stand up in front of the orchestra. But it's in the third movement the real profundity of Walter's interpretation becomes apparent. Of course he recognises the parody element, but he also manages to take it one step further, mixing with it just a hint of tragedy to make it matter to us even more. The band music interjections are beautifully "placed" with hairsbreadth judgement of rhythmic alteration, the Wayfarer song interlude is much closer to the original song which is an important and illuminating touch. The return of the march at a slightly quicker speed, another fine judgement of tempo, takes us deeper again because, if there was slightly less of an element of parody in the first presentation of the march, here if anything there is even more. This for me is the key to why this interpretation of the third movement is the greatest of them all. This is the kind of dramatic touch only a conductor of Walter's experience could have made. It's in the fourth movement you notice the greatest difference between this recording and Walter's earlier one. In New York his overall tempo is more conventional, even though filled with the special insights he carries forward to his stereo remake. In 1961, however, he is broader, grander and it's hard to choose between the two approaches as both are valid. My own view is that in the second recording he builds on his first and the gain, especially in the opening section, is that the music is less frenzied, more sky-reaching, rather in the manner of Horenstein even though I think the new York Philharmonic prove themselves the greater orchestra. Walter plays the lyrical second subject to the manner born and note the double bass pizzicato. Yes, Horenstein and Kubelik might be purer, but Walter's special brand of old world nobility brings its rewards. Despite the broader approach, the central "false" climax is paced superbly and never flags. All the listener needs to do is be aware that Walter is taking the wider view, seeing a bigger picture, which then means that when the nostalgic recall of the symphony's opening arrives the more it stays in the mind. The coda towers as much as Horenstein's. You might argue Walter is too steady but you would need to have a heart of stone not to respond to the sense of completion and hard-won confidence. Another great recording from the recent past re-surfaced in remastered sound a few years ago. In 1957 Sir John Barbirolli made what must have seemed a landmark recording with his Hale Orchestra for the Pie label. This has at last re-appeared on Dutton (CDSJB 1015 purchase) and deserves as serious consideration as the others we have looked at so far. Firstly it's possible to be aware, as with Kubelik's first recording for Decca, of a genuine sense of discovery being enacted. Nothing sounds routine, every bar is invested with a special, questing quality. The introduction to the first movement is achingly nostalgic but notice also the phrasing of the horns, quite unlike anything you are likely to hear today. It's as if Sir John rehearsed them specially for this moment. I also love the woodwind contributions which chirrup and twitter like in few other versions and lay the groundwork for a "folksy" reading of the Wayfarer theme which seems to light up this section with a rare gayety. In the transition into the development notice how Sir John refuses to yield to the temptation to slow down. He is aware, as he seemed to be in all his Mahler, of the importance of balancing inner detail with outer structure and this can be felt right through the whole performance. For "performance" it is, as this is one of those recordings which really sounds like it is being given live. Again the detailing of the woodwind is superb as the horns announce for the first time what will be the "clinching" theme of the movement. Under Barbirolli this also conveys a remarkable sense of a page having been turned in the "story" of this work. The burst of the climax at the start of the recapitulation has grandeur but it's still part of the overall structure and in keeping with Sir John's lyrical, folksy approach. He really manages to convey the many-faceted nature of this movement to a degree that is rare. The Scherzo is tremendous as the main material trundles along with weight and a welcome ungainliness, aided by some cheeky "up-slides" from the strings, which is surely what the young Mahler meant us to hear. Overall it's so refreshing to hear this movement given the respect it deserves as too often it's almost thrown away. In the Trio Sir John manages to stay a few steps short of mannerism and the effect is of an ironic comment on what immediately precedes and succeeds it. In the third movement the double bass solo at the start is lugubrious, full of character and heralds a reading that rivals Walter's. Barbirolli recognises the parody, the many-layered depths, the grotesques and the ironic humour. Why can't more recent conductors simply listen to a recording like this one too and learn from it ? When the episode with the first band music interjections arrives Barbirolli just seems to move into a different gear, chivvying the music along deliciously, sleazily too, and with so much native character it's hard to imagine anyone could possibly play this in any other way. I also liked the way that in the Wayfarer quote at the heart of the movement Sir John manages to maintain the march beneath: a small touch but one that sums up so many like touches in this great recording. In the return of the march Barbirolli, like Walter again, gives it a slightly different bent. With Sir John it's a case of accentuating the kaleidoscopic textures, more chivvying of the band and a new tinge of the unhinged. The fourth movement brings one of the finest interpretations on record. There is dash and energy in the opening, the strings especially darting and diving as if on fire. The transition into the lyrical second theme is exemplary in its focus too and the string ornament in the theme itself take us back to another age, to Mahler's own time, perhaps, giving a hint of how this might have sounded under the composer. Maybe Barbirolli just intervenes too much in the big tune, but it's marginal. There is abandon and energy in the central section where every aspect is taken care of, including the famous "luftpause", usually conspicuous by its absence. The recall of the opening material that climaxes on a further presentation of the lyrical second theme glows and the coda brings a sense of joyous release that needs no slowing down of tempo or bawling of brass. 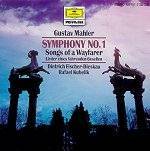 This is another Mahler First that should be in every collection. There are drawbacks, it must be admitted. The playing of the Hallé Orchestra of 1957 cannot match its more famous international rivals in corporate elan or weight of tone. Their playing has the air of the homespun and there are a handful of rough patches. Strings are thinner too, lacking saturation quality. However, the Hallé's sheer commitment and the way they respond completely to what their conductor asks of them should win over all but the most hypercritical. Another conductor with more than one recording to his credit is Leonard Bernstein. His final one with the Concertgebouw Orchestra of Amsterdam on DG (4273032 purchase) is the most easily available and I believe his best. His first movement is one of the finest on the market. It opens with a dreamy haze, beautifully wafted along by woodwinds and fanfares from great distances. The Wayfarer theme in the exposition is sweet and unadorned and there's just the right amount of brooding presence at the start of the development, with a special nod to the cuckoo calls which come over as quite malevolent. He builds to the great outburst at the climax of the development to give a real sense of arrival and charges to the end with plenty of momentum. The main Scherzo material is splendidly trenchant and with a heavier gait than usual, but when the Trio arrives Bernstein starts to take the extra hand in proceedings that will, for me, ultimately spoil this recording. He can't resist swooning and hamming in music that really can't stand it: trying to make it too worldly and the result is mannered. In the third movement Bernstein takes a surprising decision over tempo to deliver a quicker performance than everyone else. I think he's trying to accentuate parody but at this speed I don't see how he can. Even the band music interjections fail to make a real effect and no amount of expression by Bernstein can really help at this tempo. At the start of the fourth movement there are a couple of agogic distortions which I find more irritating each time I hear them. Apart from this, however, the playing of the orchestra is second to none, as it is elsewhere, conveying well the angst of world-storming youth. Inevitably Bernstein slows down to the transition to the lyrical second theme but delivers the theme itself in a relatively straightforward way. There are a few more underlinings to be heard in the central section but, on the whole, I enjoyed Bernstein's sense of urgency. It's interesting to hear that, unlike other colleagues, he didn't seem to lose his energy as time went on, but I wonder if he gives too much away prior to the real climax of the movement which comes at the end. The last "look-back" to the start of the work before the onslaught of the coda is as effective as the opening of the symphony with a climax big and eloquent. The coda itself is marvellous with fabulous playing from the Concertgebouw conveying a tremendous feeling of joy. I just wish Bernstein could have resisted hitting the accelerator in the closing pages. The insertion of the extra thwack from the bass drum on the final note might be as the result of a later insertion by Mahler himself on the score in the possession of the New York Philharmonic. With a little reservation, a fine recording with a great Mahler orchestra, sumptuously recorded. The current Chief Conductor of the Concertgebouw Orchestra is Ricardo Chailly and he has recorded this symphony for Decca (448 813-2 purchase). These players and their predecessors have been playing Mahler for a longer continuous period than any other orchestra, but compare the Concertgebouw under Chailly to that under Bernstein and the difference is considerable. The engineering by Decca is first class and in the introduction the birdcalls and horns against sustained strings are magical. The Wayfarer song in the exposition is sweet and refined and you can hear the acoustic of the Concertgebouw when the music fills out. I do just wonder whether the sound is too ample, too grand, for the distinctive sound of this symphony, though. The transition into the development seems intent on beauty again but I did think the first soft horn announcement of what will be the clinching theme should have been retaken as it's almost inaudible - unless this is what Chailly meant. However, there's a nice line in cello slides and a very idiomatic trumpet to compensate as the development builds. Chailly's is a romantic view then, but not one that leads him into mannerism and self-indulgence. I do miss the tang of Kubelik, Horenstein and Walter even though I find Chailly persuasive in parts. In the second movement the Scherzo is chunky and confident, but the Trio has a touch of Bernstein in that it's slow enough to lose momentum. Chailly delivers a fine third movement with a very insidious bassoon highlighted, but since we have identified beauty as the keynote of this recording it isn't surprising Chailly appears to "prettify" the band interjections. On the whole he does show more awareness of changes in mood in this movement than Haitink whose recording I have now decided to discard from this survey, even though he is still some way from the quirkiness and black humour of Kubelik, Horenstein and Walter. The "oom-pahs" in the re-appearance of the funeral march have some sense of the idiom we should be aiming for but in the whole of this recording the effect is cumulatively like a scene from Breughel as viewed from behind the windscreen of a Ferrari - Mahler in an Armani suit ! In the last movement there's great playing and recording to enjoy, especially the superb weight in the opening and the transition into lyricism is well-managed with a seamless continuity many of Chailly's contemporaries could learn from. He also maintains tension in the central section, leading us on with his sheer commitment. Here, at last, his performance does take fire and there is no question this is the best movement in the recording even though Chailly's priorities seem to prevent him exposing uglier manifestations. Not for him the raucous abandon of Horenstein or Kubelik, for example. He will maintain his impeccable manners at all times. Those looking for a modern sound recording above musical consideration need look no further. Next I would want to mention the version by the Chicago Symphony Orchestra conducted by Pierre Boulez on DG (459 610-2 purchase). The idea of Boulez in Mahler is anathema to some people. How can "The Ice Man" possibly bend to Mahler's emotions, many ask ? My reply is that Boulez is just as capable of bending to emotions as any conductor and it seems to me it's frequently only prejudice that pre-disposes people against him. His First Symphony recording is more than worthy of comparison with the greatest of the past and is also distinguished by marvellous playing from the Chicagoans and a recorded sound encompassing every facet of this magical score. Indeed, it's the way the recorded sound assists Boulez's ear for detail that is the greatest impression one takes away from it. As the first movement progresses there is a real sense of each sound being sifted and refined anew, but not at any expense of lyricism and natural expression. It's a fine balance Boulez brings off between inner detail and outer structure, I think. Lovely transition from a more focused introduction than that of Chailly also, and all the spontaneity you could ask for in the climaxes. In the second movement Boulez adopts quite a quick tempo so some character is lost in comparison with other versions, but there is certainly a gain in energy. The Trio is notable for its delicacy and turns this movement into a more classical structure in the process. Boulez brings out the latent tragedy in the third movement funeral march very well. There is quite a heavy tread which, coming after the lighter second movement, makes a fine contrast. His band interjections have less of the grotesque than I would expect (or believe appropriate), however, and this is a pity. As you would expect, the power and virtuosity of the Chicago Symphony Orchestra is apparent at the start of the fourth movement and the transition into the lyrical second subject is as seamless as the best with a main theme that is itself a model of poise and restraint. It's at moments like this that those who dislike the idea of Boulez in Mahler would nod and say "Ah, 'The Ice Man' Cometh". My reply would be that there are great Mahler conductors of the old school who play it just the same and Boulez shows himself in the best tradition. The rest of the movement doesn't disappoint with the heavens stormed magnificently, the start recalled in as clear-sighted a way as before and a coda that genuinely energises. It's comforting to know that, even at this stage in the performing tradition, it's possible for a conductor to almost re-think a score and deliver something that truly refreshes and fascinates. I still prefer "the old guys", but Boulez should not be overlooked. Now to one of the two recordings conducted by Sir Georg Solti. The one I have chosen is his first with the London Symphony Orchestra available on a two disc set from Decca (448 921-2 purchase) coupled with his first recording of the Second Symphony. I choose this because I think it's to be preferred to his second recording in Chicago. Not that I rate Solti's readings that highly, as you will see. It's just that those aspects of his general approach to this work, and to Mahler in general, that I take issue with seem accentuated in the remake. There is a real sense of foreboding in the introduction to the first movement. It seems to carry too heavy a weight and, as the cellos climb up the scale to meet the exposition proper, there's a more robust character to the music that I think is misplaced. The development section carries on this feeling of one-dimensional clarity and when the brass bursts out at the great climax into the recapitulation there is a sharp edge to the sound which will be the keynote of this recording. The second movement Scherzo is very fast indeed and with absolutely no relaxation in the trio, so I don't feel the movement makes any real impression. The solo double bass is superb at the start of the third movement (Stuart Knussen ?) and Solti is certainly aware that this is very particular music needing special treatment. Even so, I felt the first interjections of the cafe band are too ordered and drilled to make the kind of effect Mahler may have wanted and which is to be found in other versions. The Wayfarer song quotation here certainly doesn't have the sweet repose of Kubelik or Walter. Like so much else in this recording we are given just what lies on the surface and no more. There are good "oom-pahs" in the closing section but, on balance, I sensed more of a Wagnerian approach coming through. The virtuoso brass playing of the LSO in the fourth movement opening is sharp and edgy, reminding us, if we needed it, just how brass-dominated Solti's view is. He also indulges the transition from the opening material and the lyrical second theme which he then moulds and shapes in a very calculated manner indeed. It's all very heavy-handed. The sharp brass playing is in evidence again in the central "false" climax and the overall impression is of something "full of sound and fury, signifying nothing" which is also how the climax to the nostalgic recall before the coda strikes me too. There was a time when this recording was praised to the heights but that was when Mahler recordings were far fewer than now. Solti's view will be loved by many still and his second recording with the Chicago Symphony will delight those who like his first even more. To me it seems to take all of what I count as negative elements and accentuates them. The First Symphony was the second release in Michael Tilson Thomas�s Mahler Symphony cycle from San Francisco (SFS Media 8211936-0002-2 review). This is most recommendable and all the more surprising for a very recent recording when the competition is so great. I think it worth saying, though, that there is much less that can "go wrong" for the conductor in this work. The intellectual and emotional challenges are less. Provided he has a first rate orchestra at his disposal and doesn�t try to weigh down work with too much of life�s later baggage what is very much a youthful work then he should produce a satisfying version at least, and Tilson Thomas does far more than that. I admire especially the way he understands when to be serious and when not and in so doing he covers the multi-faceted nature of the piece and therefore takes in that youthful quality which I think so important. He never tries to paper over the cracks in what is quite an episodic piece either. Almost revelling in the inexperience of the way it�s put together. He keeps tempi up in the faster sections, stressing energy, but in the more contemplative passages brings out the imagination of the young Mahler very well also. Just occasionally he cannot see a gallery without playing to it, as we shall see, but this symphony is robust enough to stand it. The introduction to the first movement has just the right mixture of dream and clarity, the latter from some precise woodwind to disturb the old-world texture. This leads into a really jaunty and well-sprung delivery of the first subject "Wayfarer" song: a good example of Tilson Thomas�s propensity to spring the rhythms so well. I also liked the string slides at the start of the development section and the very precise stabs from the bass drum a little later well recorded. Touches like this involve the listener. At the climax of the movement Tilson Thomas�s colouring of the music continues to be imaginative and overall there is just the right amount of rhetorical moulding leading to a joyous dash for the end. This latter is a mood continued into the second movement which is breezy and confident, stopping only for a very witty delivery of the Trio with the catch in the waltz rhythm beautifully pointed out. In the third movement the double bass solo at the start for the "Bruder Martin" theme is far too well mannered and there is unfortunately nothing unusual in that, as I said earlier. Knowing what a perceptive and keenly attentive Mahlerian Tilson Thomas is I am still surprised he appears to fail to get the point of the solo like so many - or rather his principal player does. Tilson Thomas judges well the "Klezmer" passages a little later in the movement making the arrival of the other "Wayfarer" quote in the centre, warmly and affectionately phrased, contrast so well with it. So why not the double bass? I am sorry to press this point but it continues to perplex me why conductors cannot deliver what is needed. The return of the "Bruder Martin" march in the closing passage of the movement is distinguished by malevolent squawks from the clarinet and the distinction with which the deep brass play the counter theme. This latter contribution provides, for me, a moment of adolescent world-weariness that made me smile: a lovely touch matched only by the march music that seems to re-cross our path like something not too distant from the neighbourhood of Charles Ives. With this conductor on the rostrum, this is not such a fanciful notion. The opening of the fourth movement is distinguished by some powerful brass playing well caught by the wide range of the sound recording. Tilson Thomas does hold back and coax out the big theme of the second subject more than he perhaps should but, as I wrote earlier, this symphony can stand quite a bit of such coaxing. Just as well really because this is the movement where he allows himself more of the kind of rubato and ritardars he would have learned by example from his mentor Leonard Bernstein - most notably in the coda where he "grandstands" unashamedly. Don�t misunderstand me. It is thrilling to hear it played like this once in a while. But it does make me wish the decision had been taken by the producers to leave in the applause that must have greeted the close of any of the "live" performances from which this recording has been made. I think the end of the work, as played like, this would have sounded more appropriate with the sound of hands clapping after it. The playing of the San Francisco Symphony Orchestra is sharp, alert, colourful and committed. The brass is especially distinguished with attack and depth. The sound recording does have a wide dynamic range so a few volume adjustments will be necessary, but nothing too troublesome. Among modern recordings this one certainly deserves consideration. Set against classic versions of the past and present it is hard to justify recommending it as a "must have", though it makes it in here for superb playing and engineering. When Ricardo Muti�s recording with the Philadelphia Orchestra (EMI 5 749632 purchase ) was first released in 1984 a lot of publicity was generated by the choice of venue for the sessions. EMI had just begun working with Muti and the Philadelphia in their, then new, long-term partnership. But with time running out before the sessions for their first release they had despaired of finding a studio to use instead of The Old Met or The Academy, both of which were unsuitable. Then a chance conversation with a gardener at Fairmount Park just outside the city by engineer Peter Dix led them to an indoor baseball court in one of the wings of the park�s Memorial Hall that, after some imported acoustic panels had been pressed into service, proved ideal for recording. The sound of this great orchestra here comes across with a bloom and depth that never gets in the way of important details that themselves emerge in an almost ideal perspective. In fact it is the playing of the orchestra that most impresses on first hearing. There is no part of this wonderful score that they are not on top of. The pleasure of hearing what was then and still is one of the greatest orchestras in the world playing this music is as good a reason for buying this recording as any over and above what qualities Muti might bring. Of course Ricardo Muti is not known as a Mahler interpreter. You could say that with this recording of the First Symphony he was just a visitor to the Mahler canon. 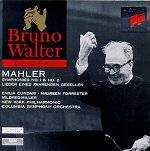 Indeed I�m not aware he has ever performed any other Mahler symphonies since this recording. But there is no need for that to put us off giving it a fair hearing. Of all the works in the Mahler canon this is the one that is most likely to yield up fine results from such a visitor. Taken in isolation from the works to come, the First can still be viewed a great big nineteenth century romantic symphony with lots of big tunes and big moments and this is generally how Muti treats it. No special insights, therefore, no impressions of this as first chapter in a musical biography, just superb playing and faultless execution in near-ideal sound. The distant atmospherics of the first movement�s introduction are floated beautifully before us, for example. It is a rather still landscape, however. Not one that shimmers as evocatively as it can. A landscape without figures, you might say. I also feel that once the main material of the exposition gets underway the introduction appears much more detached from it than usual. A sign of Muti�s Mahlerian inexperience, perhaps. Later on the development has superb poise but note the careful portamenti on the cellos. These are correct rather than idiomatic: the score being obeyed rather than read and understood. Listen to Horenstein recorded in Vienna in the 1950s for the real Mahler experience here, though the contrast in sound could not be greater. The great orchestral outburst prior to the recapitulation with horns whooping like bridling stallions is built to and delivered with great sense of power in reserve at first then a real feeling of release. This is the first time in the recording that you have the chance to hear the fine acoustic of Memorial Hall playing its part and I�m sure it will impress you as it did me. In the second movement the superb lower string articulation is a good example of the stunning orchestral playing to be heard throughout the performance. Perhaps Muti does just see this movement as only a jolly set of dances, though. In many ways this is what it is, but others can find far deeper resonance, especially in the sickly trio. In the hands of a Kubelik or a Horenstein or a Bernstein it really pricks at the imagination more where Muti is a little too cultured and refined here to get beneath the skin. Is he perhaps still in the first flush of excitement at standing before such players and wants to show them to their best advantage? The third movement begins very subdued and veiled. The lack of any real character and grotesque in the solo double bass opening again suggests to me that Muti is really skating the surface of this music, again just obeying the score rather than understanding and probing it. As the movement progresses that dapper refinement I noticed in the second movement is still to the fore. In a movement that is one of Mahler�s most early distinctive creations this is certainly a loss. However, again I cannot but praise the beautiful playing of the orchestra and the excellent balance of the sound and likewise all through the last movement. Though here it�s now a case of a great virtuoso orchestra simply being given its head to revel in that new acoustic and the obvious confidence they have in their new Music Director. Here is all the power and depth of sound that you could wish for in a performance of this movement. But I was also impressed that never in the big romantic tune this movement contains does Muti ever become self-indulgent. He certainly has enough grasp of what is going on not to divorce such a wonderful melody from what surrounds it and pull it about like some ham actor reciting romantic poetry. At the very end the coda towers and storms but is likewise never coarse, never shouts at us and loses its temper. There is real eloquence at the end with the horns especially well recorded to round off a performance I was glad to get to know again, even though it can never be a front recommendation. In the final analysis Mahler�s First Symphony is much more than the eloquent showpiece for great orchestras that Muti and the Philadelphia deliver. However, full marks to EMI�s engineering team for capturing them on the wing and for reissuing this superb recording. A performance to stress this symphony as a stunning orchestral showpiece, with sound recording and playing of the highest order. Next, two recordings that might get overlooked, which would be a pity. Herbert Kegel (Berlin Classics 0090382BC ) has a very persuasive way with the main "Wayfarer" theme especially and puts a real spring into the steps of the rhythms. I also liked the unashamed way he gets the strings to swoop in the portamenti asked for or expected. It is surprising how many conductors shy away from this. In fact the string playing throughout this recording is of a very high quality and note that this is the Dresden Philharmonic not the more famous Staatskapelle, but they need not fear any comparison. I also admired the way Kegel gradually increases speed as the end of the movement approaches, winding up a good momentum to carry us to the end. The second movement has a surprise at the very start in that Kegel introduces an empathic and unmarked accent into the dance rhythm I have never heard done before. It could even become annoying on repeated hearings but there�s no doubt it�s distinctive and the orchestra appears behind Kegel all the way with those string slides again apparent later on. The overall tempo for the scherzo is steady and ungainly and I find this more persuasive than some of the more impatient interpreters we sometimes hear. The vibrato on the horn opening the trio tells us we are east of the Iron Curtain but it�s not too troublesome. The trio itself is very suave and knowing and I found myself smiling all the way through as it seems as if Kegel might even be sending the music up. What an engaging guide to this work Kegel is. When the main scherzo returns that added accent I noted the first time round has gone, which is interesting to say the least. Reedy and oily is the best description for the double bass solo in the third movement and Kegel certainly does little to smooth out the contours of the opening as some can. You can hear the harp tolling too, which is not always the case. I was also surprised and delighted to hear one of the best evocations of the Klezmer band passages from an East German orchestra, but that is what we have here - the sharp cymbals and the way Kegel suddenly accelerates the tempo every time the band intervenes helps immeasurably. When the funeral march resumes after the soft "Wayfarer" quotation at the heart Kegel surpasses himself with the band interjections and a feeling of winding down to the end. The final solo from that bassoon is very effective before the storms that follow in the last movement. After these have subsided, I�m always impressed to hear a conductor keep the bridge passage that leads into the big tune in tempo, as Mahler requests. The big tune itself finds a deeply passionate treatment that stays within the bounds of good taste with again the distinguished string playing already noticed. In terms of execution and virtuosity this orchestra does lack the whip-crack style of some of their more famous rivals. This movement also exposes a lack of real tone in the brass section that bray a little when playing full out and it is here the recording balance, though natural and open in a quite large church acoustic, shows its analogue origin. But the playing from all departments is committed, idiomatic and full to the brim of Mahlerian colour. Not least in the emotional core of the whole work where Mahler brings back the birdcalls and the morning mood of the opening prior to the great peroration at the close. No one could fail to be moved by Kegel�s response here. The coda itself is quite fast and some will find that a minus. I suppose I do too, but in the context of such a lively and interesting recording I can forgive Kegel for driving to the end with such gusto. In concert this would have raised the roof, which is what Mahler was trying to do after all. A fascinating performance - for me it was a real find - with much to enjoy and reflect on. Not quite top flight but very well worth investigating and a real find..
Another recording which might get overlooked is by Gunther Neuhold and the Badische Staatskapelle (Bella Musica BM-CD31.9042). On the cover we are told that this is "Mahler�s First Symphony in its original version". But this is not the case. What we have is another recording of Mahler�s First that includes "Blumine" as explained above. Having got that off my chest let me now deal with the music because I wouldn�t want it to deter you from considering this recording. It�s easy to overlook labels, orchestras and conductors with whom we may be unfamiliar and in this case that would be a pity as this recording is capable of holding its own among stiff competition. In the first movement Neuhold and his orchestra manage the opening harmonies well with a fresh rather than a dreamy opening, and I always prefer it like that. Neuhold is one of those conductors (Kubelik was another) who appreciate that this is a young man�s composition with lots of lift and vigour to it. Within that he can make his cellos play some lovely slides and the climax of the movement bursts out with a great feeling of release following excellent preparation. As I wrote above, "Blumine" is then placed second on the disc so I would advise you to programme the CD player to skip over it and play it later as a separate item. That said, I like the way that Neuhold treats this as a fleet intermezzo but with a sweet trumpet at the centre and, once again, idiomatic string playing. By the arrival of the Scherzo we can hear how much Neuhold grasps the particular sound of this symphony. The high woodwinds impress and the "ground-bass" of the lower strings too. Notice also the slight slowing down for the trio section that Neuhold here presents as a delicate little dance. In what is usually the third movement the solo bass player goes some way further than many colleagues in making his instrument sound distinctive, but not as far as he might. The pace of this movement is just right to allow the "café band" passages to tell, though. Then the "Wayfarer" emotional core comes over as beautifully withdrawn and chaste. The effect of the movement is like a series of layers Neuhold pulls back one by one. The last movement bursts in impetuous and raucous. The great theme after the storm is excellently phrased without a hint of mannerism and I like the way the Neuhold keeps the whole movement bowling along with panache. In the coda there is weight but also joy and a sense of release bringing to an end a "live" performance that fully deserves the warm applause of the audience who have been so well-behaved I had no idea they had been there until then. A really good recording of the First Symphony, lively and sensitive in all the right places. More desirable versions are available showing even greater insight, as outlined above, but there are some full-priced versions that suffer by comparison. Represented here are some superbly engineered recordings, some great playing and some great conducting. There are many other recordings of this work on the market, of course, but none of those that I have heard add any more to the ones above and certainly none, in my opinion, surpass the best. There is a fine recording by Mariss Jansons (Simax PSC 1270) made in Oslo, for example, but as it is coupled with a disappointing Ninth it cannot really be considered. Kurt Masur is dull, Colin Davis is too. Yoel Levi is very well-recorded but is only a "surface-scratcher", as is Seji Ozawa. Klaus Tennstedt in Chicago is wonderfully caught "on the wing" by EMI (CDC 7 54217 2), a real "ride of your life" as always with him but, for me, he overcooks the dish with excessive excitement in the wrong places. The recordings by Rattle, Maazel, Zander and Gielen are good as First Symphony recordings to go with those conductor�s complete cycles but not, I think, quite the equal to those outlined above as individual recommendations. Inbal conducts a fine First too but as his is only available as part of his complete cycle I will deal with it in my survey of boxed sets, likewise Gary Bertini�s. To sum up, Kubelik on Audite, Barbirolli on Dutton, Horenstein on Unicorn, Walter on Sony, and Bernstein on DG, with Kegel as a "wild-card" are the current Mahler First recordings for a lifetime.